There’s no denying Joe Bonamassa has done some pretty interesting stuff in recent years, between his own best-selling albums such as Dust Bowl, Black Rock, and Live from the Royal Albert Hall, among others, and being a part of the hard-hitting British-American supergroup Black Country Communion. Among this week’s new releases, we find Bonamassa involved in a slightly different kind of collaboration, paired with the deeply talented and soulful Los Angeles singer-songwriter Beth Hart on an album of soul covers that stretches from Billie Holiday and Etta James to Bonnie & Delaney, Tom Waits, and Bill Withers. Available today on Bonamassa’s own J&R Adventures label, Don’t Explain combines Hart’s dynamic, always expressive voice with Bonamassa’s scorching guitar, backed by the same band that supported Bonamassa on his 2009 The Ballad of John Henry, for a result even more satisfying to the soul than the chocolate Jesus about which Hart sings on one of the album’s hippest tracks. Produced by Kevin Shirley (who you might say brings a little familiarity with Bonamassa, having produced his last five albums), the CD kicks off with the Ray Charles classic “Sinner’s Prayer,” which practically drips the blues treated with Hart’s gravelly, Janis Joplin-like vocals. A soulful take on Tom Waits’ “Chocolate Jesus” – described by Hart as “less of the chicken coop blues that (Waits) did, and more of a sassy, French cafe style” – follows, also offering the first glimpse of the Etta James-ish qualities to Hart’s voice to be heard on such later tunes as James’ “I’d Rather Go Blind” (to which Hart again adds a Joplin-like touch to complement Bonamassa’s guitar licks and some fine keyboard accents) and “Something’s Got A Hold On Me,” a la fellow blues-rocker Dana Fuchs. Next up is the slow, dark jazz sounds of the Nina Simone-like “Your Heart is as Black as Night,” before they break into the hard-hitting blues-rock of Bill Withers’ “For My Friends” and the quiet title track from Billie Holiday that helps showcase the pure and vulnerable sides of Hart’s vocals. The slow, bluesy start of “I’ll Take Care of You” soon transforms into a passionate power ballad, while Bonamassa joins in on vocals to make the breezy country-soul of Delaney & Bonnie’s “Well, Well” one of the album’s best numbers. The tenth and closing track, Aretha Franklin’s soul-drenched “Ain’t No Way,” pairs Bonamassa’s tender guitar strains with the full range of Hart’s voice, from low growl to heartfelt, piercing wail, rounding out a project there ain’t no way soul-blues fans will want to miss. There’s a whole lot more we probably could say about this album, but – as its title implies – there’s little need for explaining: this is one where the music truly does speak for itself. 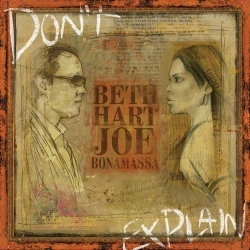 This entry was posted in Albums and tagged Beth Hart, Joe Bonamassa. Bookmark the permalink.